From Education Week, coverage of the Int'l Society for Technology in Education convention in San Diego in late June. Here's what Yong Zhao, the associate dean in the College of Education at the University of Oregon had to say about what our public education system is doing. What was interesting is that while I think most of us would believe this sounds good, as Ed Week points out, you would have to revamp our entire K-12 ed system to do it. We had a comment from a reader who had several complaints about the blog, largely around creation of threads and the belief we don't cover enough individual school items/topics. Our reader acknowledges that we create threads based on demand but apparently that isn't enough (even though readers then take control of the thread and the direction of the discussion). We also have Open Threads twice a week but that isn't enough either. Charlie and I regularly get guest posts sent to us and about 90% of the time print them verbatim. We have had this policy for years. So if you have a topic you want to write about, please send it to us. This is a down time for the district; summer is a time it goes very dead. Much of what we could discuss about various topics in the district is, at this point, speculation. Superintendent Banda has to come in, get the lay of the land, hire the new people for senior positions that are either interim or open (like Special Ed) and then lay out the agenda of what he proposes to do. I do not believe, for almost any program, that much will change for this coming school year. Charlie and I are activists and so yes, our focus tends to be on the district view but we frequently talk about issues at a school level. We are glad for any input or information to expand the discussion. The reader also complained about the coverage of I-1240. That is not going to change. The initiative is one that will have profound and lasting changes on our district. We have always been about information for our readers and I feel strongly about making sure that you know and understand what you are voting on. If you see the word "charter" or "I-1240" in the title you can always skip it. Charlie and I don't have much time together to discuss the blog. But we are absolutely willing to start a thread topic for someone or post a guest thread. If any of you would like to become regular contributors on a specific topic that you know well, let us know. We will give it due consideration. The blog has grown and evolved since Beth Bakeman had the courage (fueled by passion for public education which is what drives Charlie and me) to start it. Not really by design, we have built a brand and we would have to think long and hard about any major changes. You can understand that we would have to be very careful and very sure of anyone we allow to post on the blog. Our door has always been open and will continue to be. Contact me at sss.westbrook@gmail.com. Bob Boesche, Interim Deputy Superintendent, met with South Seattle Community College President, Gary Oertli on Thursday, 6/28 to discuss possibilities for continuing to house Middle College HS at SSCC. Mr. Boesche reports that President Oertli was very cordial and expressed great regret at having to ask MCHS to vacate its classrooms at SSCC. He made it clear that the college has had an excellent relationship with the Middle College students and staff, as well as with Seattle Public Schools, and that the college simply has no more space, due to increasing SSCC enrollment. He also confirmed the decision was not based on any financial obligation (facilities have been provided at no cost). In addition, he confirmed that there is not space in the parking lots for portables. Mr. Boesche and SPS staff are continuing to explore other sites in the Delridge/West Seattle area, ideally in proximity to South Seattle Community College. Updates will be given as soon possible when we have any news. I am preparing an annotated analysis of 1240 so that anyone and everyone can see exactly what it says (and does not say which is the case in many places). So let's start with the opening section, 101, which is basically a preamble. You'd think I wouldn't find much here but they get out the gate with a lot of what is overblown and not data-provable rhetoric. So there seems to be a couple of themes emerging from the pro-charter side. First, it seemed it was about choice. "Why do you oppose choice for poor children?" This is what one of the $100k donors said to me. So first of all, that's a fairly unfair and disrespectful thing to say. There is no one that would oppose choice for poor children. Better education? Absolutely. But what is interesting is this idea that charters are so innovative and that we will see all sorts of new and varied education options. I categorically reject this idea (based on the evidence from the last 20 years and 41 states). We can hope that will be the outcome but I doubt it. What the initiative will give is choice and only choice. No guarantee of better or more innovative schools being the charters picked and that they can deliver. For parents who want different (read:better), it will be a hollow choice. There is nothing modest about this proposal. (And fyi, embedded in the initiative is the ability to raise the number of charters beyond 40 without going to the Legislature. Thanks to Kate Martin for pointing that out.) This is a very aggressive charter bill with the most wide-ranging conversion section/trigger in the entire country. Accountability? It's in there but it's vague on enforcement. Remember, the DOE even said that one of the number one complaints from authorizers around the country (to everyone's chagrin) is the inability to shut down poor-performing charters. Over at Washington State Wire, they get it right in their headline "The Gang's All Here! Tech Biggies Backing Charter Schools - Gates Now at $1M." But it looks like what it looks like - a small group of wealthy white people acting paternalistically who believe they "know" what is the right answer for poor children. Now, charters will not come to their children's schools nor will their children ever attend one but really, they know best. I have never met Ms. Martens. But that she desperately wants to marginalize me and my work against charters by name-calling? Weak. You don't win arguments (or votes) by name-calling. Board agenda. One key item is the introduction of Policy 0030, Educational Equity (Race and Equity). The C&I Committee had a back-and-forth on the language of this sometimes delicate policy. I think it may need further tweaking as the four Directors at the committee meeting all had issues with the language and I suspect the other three will want to weigh in as well. There is also the intro for the UW Experimental Education Unit which is not a well-known partnership between UW and the district. Unfortunately, true to form, this item is not available even though it is just days until the Board meeting. At some point, the public has the right to see this kind of information in a timely manner. Also interesting is the resolution for a grant by the Legislature, through OSPI, for $9.4M to do work to reopen John Marshall, Boren and Van Asselt. Here's the link to the work. This is good because it frees up BEX and BTA money for other issues. Also Policy 2200 is back (Program Placement) but I have not yet read and reviewed it. They also will be approving the budgets for next year. This is the last weekend for I-1240 to get signatures. There are many events as well and it is also likely to be a weekend for 4th of July prep. Get out there with flyers and info to any event/store/market near you and educate voters. Urge people to Decline to Sign. Reminder: sign-ups for the School Board meeting next Tuesday (not Wednesday because of the 4th of July holiday) are tomorrow, Friday the 29th starting at 8 am. The agenda is not yet available. This will be the first "official" Board meeting for Superintendent Banda. I note that there has been discussion here over the K-5 STEM program, late-breaking principal placements and our favorite, the math curriculum. This is a good opportunity to get his attention. There is also a Executive Committee of the Whole today from 5:10-6:30 p.m. It could be quite interesting. Speaking of Banda, the event in his honor at El Centro de la Raza (with the Alliance) was very nice. I realize now that the Alliance needed a head count as they generously served food and drink. It was a big crowd when full (I'd say at least 200+ people). The Mayor attended as did Michael DeBell, Sherry Carr, Kay Smith-Blum and I think Director Martin-Morris. There were a few interesting comments from the speakers. Sara Morris, head of the Alliance - "Bringing communities together" has been the Alliance's bedrock. Really? I would not have thought that at all, at any time in the Alliance's history and particularly not now. Tom Stritikus, Dean of the College of Ed at UW - He chose, for whatever reason, to give his entire speech in Spanish. It was at a Latino group's building but as Estela Ortega said, it was room that was a rainbow of diversity. I thought it odd but I believe the Dean wanted to make public a link with Banda but I think it was off-putting to many (at least three people asked me what was up with it). Michael DeBell - Also spoke some Spanish but switched back to English. He talked about Banda's ""journey to Seattle" and how Banda was the "CEO" of the district. He asked the crowd to give him time to "make connections, to allow him to learn what he needs to know." Jose Banda - Relaxed, friendly, good at making connections. He stood for at least an hour, greeting everyone who stood in line to meet him. It was a great start. The Stranger Slog is reporting that Bill Gates' spending for I-1240 -which is not even on the ballot yet - is over $1M. Fine, he wants a fight, he'll get one. People of Seattle please understand. This is NOT about right and wrong - it's about telling the truth. Gates, Allen, League of Education Voters, Stand for Children, all these people supporting charters will NOT tell you the truth about what this initiative will or will not mean to Washington State. They will give you hearts and flowers, challenge you on why you (yes, you) don't want to allow poor and disadvantaged children choices and tell you charters are better. I will tell the ENTIRE truth about charters and this initiative (because folks, what we end up with is what is in THIS initiative). We won't win on money but we will win (or have a fighting chance) if people promise to do their duty as voters and listen and ponder what they are told. And, look at who is funding this effort. Is this a parent-driven, grass-roots effort? It is not. From Ed Week, a story about the US Supreme Court declining to hear a case about using race in K-12 enrollment to encourage racial diversity. Shades of our own case. NY Times Sunday Review op-ed on Brown v Board of Education and what it has and hasn't meant for school desegregation. Ed Week also has this article about charters and segregation. The brief from the Washington-based National Alliance for Public Charter Schools, or NAPCS, highlights six high-performing charter schools, three of which specifically formed to create a more diverse alternative to existing neighborhood schools. The remaining three focus on serving disadvantaged children. That report suggests that the benefits of having more integrated charter schools may outweigh the successes of a few of the more well-known charters, some of which are more racially isolated. “If charter schools were uniformly producing high achievement levels, then there would be real logic to packing as many poor kids into charters as you could,” Mr. Kahlenberg said. But those schools have mixed results. Both reports also include recommendations for federal and state policymakers, including suggesting that charter schools be permitted to receive federal startup funding even if they use a weighted lottery—rather than a random drawing—in order to create an integrated student population. Also, can't remember if I linked to the GAO study about Special Education students being underserved by charters. Ed Week, a good 10-year graphic on the rise of the "education industry's" campaign and lobbying efforts. With this kind of money being thrown around, it clearly is not about just doing it for the kids. There is money to be made. Another story, this from The Boston Phoenix, goes deeper. It gives a history of Stand for Children and their state-by-state change from advocating for parents to advocating for ed reform. Yet the big picture should be daunting to progressives. As inconvenient as it is to consider, there is a mounting body of evidence that suggests much of the so-called school-reform movement is a stalking horse for the for-profit education industry. Simply put, the same free-market-cowboy values that fueled the economic meltdown of 2008 are now occupying box seats at the school-board roundtable. The College Board is promoting its "Don't Forget Ed" campaign for the upcoming elections. They started it to urge candidates to keep education on the front-burner. I did try to get more info from the College Board on why they are doing this, who they want to reach, etc. but no answer. Want to Talk Education with Obama? National PTA®, in partnership with the White House and U.S. Department of Education, announced at its 116th Annual Convention and Exhibition an unprecedented opportunity to recognize extraordinary PTA volunteers. Twelve PTA members working to improve the lives of children through involvement in PTA and education will be honored as White House Champions of Change at a special event and policy briefing with PTA leaders from across the country at the White House in August. Individuals can nominate exemplary PTA members who have dedicated time, talent and a powerful voice to improving educational equity and opportunity for every child. To nominate someone, visit the White House Champions of Change website by July 10. “As parents, both President Obama and I have so much respect for the work parents do as PTA leaders. In Washington, we aim to be a supportive partner with states, school districts and schools but we know that the real success for students happens because of the support that PTA members and teachers provide,” said U.S. Secretary of Education Arne Duncan in a video to convention attendees. “National PTA is honored that the White House and U.S. Department of Education is looking to recognize our members for their work. Grassroots PTA members are the lifeblood of our association and they champion for children every day. There are millions of unsung heroes nationwide making a difference in the lives of all children, not just their own. Through the work that they do they are helping to ensure that our country’s best days lie ahead,” said National PTA President Betsy Landers. The Champions of Change program was created by the White House more than a year ago and recognizes ordinary Americans across the country that are doing extraordinary work in their communities. During the last year they have held more than 40 Champions of Change events, honoring more than 500 Champions from all 50 states. National PTA is proud to partner with the White House in honoring the hard work and dedication of our nation’s parents, families and child advocates through involvement in PTA. The Unified School District in San Diego, California is receiving nearly 26,000 iPads as soon as this fall. The school district's commitment has been labeled the largest iPad deployment in K-12 schools in the United States. The students will likely be using iBooks, which is an application that provides students with textbooks on the iPad as well as new study options like note-taking. Students can also use this app as well as others for writing and math without having to carry several heavy books to class. Overall, iBooks offers a more interactive learning experience that the district hopes will engage students. They will be using them in 5th and 8th grades and some high school classes, about 340 classrooms. The answer is Proposition S funding, which was passed in 2008 and offered money for classroom technology. Each iPad was purchased at $370 a piece (sic). FYI, that per iPad cost is only $30 less than retail. It is unclear if there was any teacher input on this idea. I think the district believes it will save money on books as well as make use of many applications. Good idea or was there a better use for $15M? * Boren, Fairmount Park, John Marshall and Wilson Pacific buildings. More detail on work done at each school is available at bta.seattleschools.org. I believe we will see ever-changing org charts for several months as Banda gets the lay of the land and new hires/shifts are made. That makes two Ex Directors changed (Aurora Lora, leaving SPS, and Phil Brockman, moving up). As we continue to plan for the 2012-13 school year and beyond, we recognize the need for increased collaboration between all departments. Providing all students with an education that will prepare them for college, career and life is our mission, and along with that comes many operational duties. Additionally, coordination between departments is essential as the District begins to discuss system-wide changes that impact schools and families, such as school boundaries, bell times, instructional programming, athletics and transportation. To ensure this, today I am pleased to appoint Phil Brockman to a new position: Executive Director of School Operations. Phil, who has served as Executive Director of Schools for the Northeast Region since 2010, starts this grant-funded position on July 1. Thanks to a Department of Education grant, called the High School Graduation Grant Initiative, Phil will be able to use his academic expertise to support both instructional programming and the operations team’s system-wide initiatives. In addition, Phil will provide support to schools in the High School Graduation Initiative, promoting student connectedness, school attendance and graduation. This new role will also establish a bridge between the regional Executive Directors of Schools and operations to ensure collaboration and provide support to schools during academic and operational system changes. He will report directly to the Superintendent. Phil brings to this new role more than 30 years of experience at Seattle Public Schools. He started his career as a math and physical education teacher at Rainier Beach High School in 1983. He served as an assistant principal at Madison Middle School from 1992-1997, as principal of McClure Middle School from 1997-2000 and as principal of West Seattle High School from 2000-2004 before returning to his alma mater, Ballard High School, as principal for six years. In 2009, Brockman received the Alliance for Education’s Thomas B. Foster Award for Excellence for outstanding leadership. Human Resources will soon post an opening for Phil’s current position, which we hope to fill next month. Please join me in congratulating Phil on his new appointment. Update: LEV has a daily news round-up and yet are silent on these two pieces (despite the fact that they are helping to sponsor this initiative). Now I get them not wanting to link to anything written here but not The Stranger? Odd. Our friends over at The Stranger Slog were kind enough to ask me to write a No on 1240 piece and had another parent write a Yes on 1240 piece. The focus of each piece and the comments (and numbers of) are interesting. One thing I find interesting is The Stranger is becoming a bigger player as a voice of editorial power in this town. I know some of you may disagree - I am not saying they are the Times - but in Seattle, I think many voters who do not want to listen to the Times have turned away to The Stranger. The Stranger, for all its smarty-pants, foul-mouth talk, does do its homework. And, they do call themselves out when they get it wrong. You don't find that kind of humility that often. As I ponder the ballot, I come to the following conclusions. 1) it's a crowded and busy ballot. Plus side, many more voters. Minus side, very long ballot and initiatives come at the end. There is a distinct drop-off factor. 2) Gay marriage. That'll keep 'em engaged until the end of the ballot...or will it? 3) But long ballot so maybe it will really come down to who can get that passionate vote out - the pros or the cons. Naturally, the difference may come in the Puget Sound region where the action is and the largest number of voters are. It's all in the messaging and it will be interesting to see what that is for each side. But first, it has to get to the ballot. If the California signature gatherer that Brian Rosenthal encountered is right, it may not get there at all. King to Detroit by Monday? Although he hasn’t told his boss or his school, it appears that Lowell Elementary Principal Gregory King is moving to Detroit to work for former Seattle Superintendent Maria Goodloe-Johnson. A spokeswoman for Michigan’s Education Achievement System, where Goodloe-Johnson is the top academic officer, confirmed Monday that King is under contract to start there as a principal next week. That's $14 an hour and $4 a signature. No wonder their Craigslist ad says you could make $1,000 a month. And yet they had to import them from California? Interesting. Update: I had thought the Yes on 1240 would have thru July 6th to get signatures but it seems it is July 5th with all petitions due to the Secretary of State's office by July 6th. Opinions please; will the 4th of July holiday hurt or help this effort? People too focused on fun to pay attention or great opportunity to reach masses of people? The charter school initiative, if approved, would create a time bomb that would seriously threaten Seattle Public Schools. The threat doesn't come from the possibility of a charter school organization creating a school in Seattle - at least not if they get their own building. The threat comes from the possibility of a conversion. A conversion occurs when a majority (50% plus 1) of either the teachers or the families at a school request conversion to a charter. If that were to happen at an attendance area school, then the school would become, essentially, an option school. The attendance area boundaries all around the school would have to change to cover the converted school's attendance area so that every student had an attendance area school. There is no school in Seattle that has any excess capacity to speak of. Any addition to the attendance area of any school - particularly one of this scale - would result in the instant overcrowding of the school to something like 130-150% of capacity. And that's at a school in an area with just ordinary capacity management headaches. In the crowded parts of town it would be MUCH worse. Imagine if View Ridge converted and every one of those students had to be granted guaranteed assignment to a different attendance area school in the northeast. I had already planned on attending this event but wasn't sure it was open to the public; it is. To note: still nothing from the Mayor or Councilman Burgess on Superintendent Banda's appointment. I have to wonder about that and I hope they both show up to this event. What: El Centro de la Raza and the Alliance for Education, together with a host committee including nearly thirty community groups representing every corner of the city, are pleased to host a Community Welcome Reception for incoming Seattle Public Schools Superintendent José Banda. The free event will feature a global selection of food, including El Quetzal, Green Leaf and Fusion on the Run. This was a fascinating story on NPR. There are on-line schools to be sure but apparently there is a (for-profit) company, K-12, Inc. that runs online charter schools in many states and wanted to get into North Carolina. A little reviewed clause in their charter law allowed a small district to be their authorizer for 4% of the take. So you're a little district, low on funds, and you get offered "help" (or a kickback, take your pick) from an outside source with no strings attached (except maybe, stay out of their way). What would you do? Lt. Governor Brad Owen is once again encouraging all interested Washington youth to apply for positions with the Legislative Youth Advisory Council (LYAC). The 22-member council, comprised of youth ages 14 to 18, advises the Legislature on key issues of interest to Washington youth. Members serve two-year terms and, if eligible, may be reappointed for additional terms. Applications are due June 25 July 2. The lieutenant governor makes the final appointments to the panel based on the recommendations of LYAC membership. The 2012 application form is available on the LYAC web site at http://www.k12.wa.us/SocialStudies/LYAC/ as well as on the lieutenant governor's web site. For more information, please contact lyac@leg.wa.gov or (360) 725-6039. The people who say that we need charter schools have no trouble pointing out the obvious fact that the bulk of our public schools don't work for the students, particularly minority students, students from low-income homes, students with IEPs, and English Language Learners. 1) We don't need charters to develop and implement strategies that are effective with these populations. the public schools have license to do these things. We can point to a number of public schools that have reorganized around more effective strategies and have shown strong results. 2) There is no reason to believe that a charter school will do any better than the public schools with these challenging populations. The simple fact that the school is a charter does not mean that it will do anything different or better than what a public school does. I have made both of these arguments myself. Usually I make them to charter school supporters who aren't really very bright or very well informed. Usually they are incapable of overcoming either of these arguments. I have also tried to make them with charter school advocates who ARE bright and who ARE well-informed. They have a response and it's a damn good one. This should be a jam-packed meeting as well as one fraught with varying agendas. They will be discussing the Program Placement policy which guides what new programs get created, where they are placed and who nominates/decides. It seems like staff is making noises about "community input" but that's not where the action is. Also on the agenda for policies; nutrition, "ensuring educational equity", student discipline, advanced learning. There will also be discussion of the partnership agreement for the Families and Education Levy and the Creative Approach Schools Board oversight process. Public Hearing on the Budget from 4-5 p.m. This is a legal requirement of the district for any citizen who wants to weigh in on the budget for 2012-13. Note that you sign up right before the hearing and they only have the hearing as long as there are speakers. There are normally 1-3 so I would get there right at the start because they do not have to stay on until 5 p.m. Accountability Audit Exit Conference 5-6 p.m. I'm not completely sure about this one but I believe it is about how the district is fulfilling its promises in making changes/corrections to previous accountability findings. Executive Session about a complaint against a public employee (closed to the public) - 4-5 p.m.
Executive Committee of the Whole Meeting. 5:10-6:30 p.m. Reminder: Director Betty Patu event at 7 p.m. at Pravda Events Center. Info at virtuouschg@msn.com or 425-891-6705. Community meeting - Director Patu from 10am - noon at Caffe Vita, 5028 Wilson Avenue S.
Keep in mind, July is the down month for both district and Board with few meetings happening. There is a Board meeting on Tuesday, July 3rd (because of the July 4th holiday on the regular first Wednesday of each month meeting date). I note there is also a public hearing on the ASB fund before the Board meeting which also is a budget item that legally must seek public input. This Board meeting will be the first one for Superintendent Banda in his official role. Brian Rosenthal, of the Times, wrote a lovely piece about Interagency, one of the specialty programs that helps students in SPS graduate. It's a fairly unflinching look at some troubled teens and the adults who work like crazy to help them find a good path in life. He notes that this is an expensive program for the district but frankly, isn't this what tax money is for? Some kids have tough backgrounds and do not have the supports to move ahead without Seattle Schools. We say we want ALL kids to graduate? Well, this is where the rubber meets the road and the district is doing its job. Abandoning these kids is not the answer and if sticking with them, helping them graduate and creating the dynamic where they believe in themselves and they go from drifting to being a solid citizen, then it is all worth it. Congratulations to those 78 grads, Principal Kaaren Andrews and all the staff. This is the hard, intimate work of public education that no TFA could pull off, no computer program could pull off and no charter school would want to do. This program's existence is the essence of public education. That was an interesting exercise. I just spent two hours meeting people and handing out the flyer on Decline to Sign. There were two signature gatherers there (same two from the last time). They first tried to say I was with the teachers union and I told them - out of earshot of voters - to NOT say that. They stopped. I didn't hear a lot of what they were saying as it was outdoor and noisy. Did it help to be there? Absolutely. Third, I only had two people challenge me. I urge you to consider going to any indoorish venue like Target. I believe it makes a difference and many are glad for the information. One woman, after signing, looked at my flyer and said, "Is this true?" and I told her it was and I could show her in the initiative. She asked me why the signature gatherers didn't say anything and I told her it's not how to get signatures. The rain is a good thing for this weekend because it is much harder to get signatures outside (like outside of grocery stores, etc.). Get out there and do this - you can make a difference. Here is a link to a story on the LEV blog with the headline "Washington among the worst when it comes to Black male graduation rates". "The Schott Foundation has released individual report cards revealing the graduation rates of Black male students, and Washington is among the worst performers." "The national graduation average for Black male students in the 2007-2008 school year is 47 percent, which technically means that Washington is slightly above average." Waitaminnut. Does LEV know what the word "worst" means? If Washington State is, in fact, above average, how can LEV claim that it is "among the worst"? Washington isn't even among the worse, let alone the worst. If this article is reflective of the LEV's ability to interpret data, then they stink at it. Now, I'm not proud of the state's 48% graduation rate for black male students, nor am I proud of the state's graduation rate of 66% among white male students. Consequently, I'm not proud that our "gap" is only 18 percentage points instead of the national average of 30 percentage points. Still, that doesn't make us "among the worst". By the way, the LEV doesn't mention that this data is from 2007/2008. I have to wonder if the LEV misrepresents all data this way or if this misrepresentation was among their worst. Policy 2200 - What Should It Be? Director McLaren chairs the Curriculum and Instruction Policy Committee. This Committee will discuss the revised Policy 2200, Equitable Access to Programs and Services, at their next meeting, scheduled for Monday, June 25, from 4:00pm to 6:00pm in the Board Conference Room at the JSCEE. It states an unequivocal value of equity in decision making regarding the siting of programs and services. It states an unequivocal value of transparency in decision making regarding the siting of programs and services. It sets out clear expectations of evidence to be provided by the Superintendent that the above criteria have been met. It states an unequivocal value for clear, efficient parameters for community input. It has had the benefit of community vetting via email or conversation with Board members. Last day of school - cool and cloudy. That's our Seattle. But for kids, summer vacation is any day they let you out of school for the year. Had a great time dancing last night for 826 (tutoring organization). Dancing with young people keeps you young. I did get a prize (coffee and bacon) for "Tiniest Dancer." We likely won't have quite as many stories over the summer with the end of the school year. But we will keep rolling with our new superintendent coming in, fighting I-1240, finally getting to some national stories that have been on the backburner and whatever else comes up. Have a great summer and read to your kids (or find them some good summer reading)! SIFF is showing 15 Studio Ghibli films, most of them in both English and Japanese, over the next two weeks. If you are not familiar with this work, this is a wonderful opportunity to repair that tragic failure. I think all of the films are fine for children, most of them are brilliant for children, and nearly all of them are simply brilliant. Small children will adore My Neighbor Totoro, Pom Poko, Kiki's Delivery Service, Porco Rosso, and Ponyo. Those over 9 or so will love Nausicaa of the Valley of the Wind, and The Cat Returns. Those over 12 will enjoy Castle in the Sky, Howl's Moving Castle, Princess Mononoke, and Spirited Away although these may be frightening or too violent for some younger children. I'm not sure if younger audiences would appreciate Whisper of the Heart, Ocean Waves, or Only Yesterday, and, to be honest, I'm not familiar with the film My Neighbors the Yamada's. I can recommend all of these films for adult audiences, even those that young children would enjoy. The films are available on DVD, but you should take this opportunity to see them on the big screen. The Curriculum and Instruction Policy Committee has posted their agenda for their June 25 meeting. The meeting is expected to run from 4:00pm to 6:00pm on June 25. The Committee meets in the Board Conference Room. This will include the new federal requirements. I don't know what this is, but it is sure to be interesting. I think they are against them. Hmmm. Written rules. What a novel concept. It's so crazy, it just might work. This item may be of some interest to a few folks out there. This is never as interesting as you think it is going to be. Oh! The staff is going to include the Board in this. How thoughtful. The agenda makes this appear to be only a status review, not a discussion of the policy. It will, in fact, be a discussion of the policy. Not being the most technically able people I did not link the flyer properly. I have redone all the links and here it is (again). Breaking news from the West Seattle Blog; Executive Director Aurora Lora is leaving the district. She's going to Dallas as an assistant superintendent. Her last day is July 6th. That's one TFA gone (and I hear we lost another in HR). Decline to Sign flyer here. Going to the Gay Pride parade? There an SPS float in it that will be decorated as a school bus. The Board approved the change to the advertising policy and will permit it on school calendar, scoreboards, etc. Not sure where (high school only?) and when it starts. Seattle Times' story indicates it will go to high schools only. Keep in mind, the first year, the district puts all the money into the General Fund (handy, no?) It's not until year two that ASB students start seeing money and then it's quite vague on how much. Seattle Public School employees will again take unpaid furlough days in the 2012-13 school year to help balance the budget and prioritize classroom funding. Furlough days for teachers and other Seattle Education Association-represented employees include Wednesday, Aug. 29, 2012, and a half-day on Feb. 14, 2013. Principals will take a furlough day on Jan. 3, 2013. Non-represented employees, meanwhile, will take Aug. 29, 2012, and Dec. 26, 2012, and upper management staff will take an additional two days on April 19, 2013, and July 5, 2013. The John Stanford Center for Educational Excellence will be closed on Wednesday, Aug. 29, 2012. Here is the Decline to Sign flyer. There are two to a page to save printing costs. It's fairly basic but we wanted to hit the biggest charter issues. Sat 3 p.m./Sun 2:00 p.m.
- King of the Beach Volleyball sign-ups at Alki in West Seattle, 6 p.m.
-Rock n' Roll Half/Marathon, Seattle Center, 7 am to 4 p.m.
-Gay Pride parade 11 am - starts at 4th and Union to Denny Way and 2nd. Plus tons of other events. Beacon Rocks! Beacon Hill festival from 1-5 p.m.
- surprisingly, large sporting events. I've been told by several people most sports fans want to get inside and ignore people approaching them on the street. If you are going to a Mariners/Sounders game, go ahead. - Costco - lots of people but they don't allow you petitioning on their property. Washington State Wire did some digging and found that if I-1240 does qualify for the ballot it would only be the second-fastest in Washington State history (not first). I don't think that's anyone's biggest concern but there you are. The photo of a table with petitions on it is priceless. Click on it to read the signage. Naturally, they are at Wal-Mart. Word is that there are considerations/planning being done for the School Board elections in fall 2013. Those would be for the seats of DeBell, Smith-Blum and Patu. It is my understanding that DeBell is unlikely to run for a third term and may be running for a seat in the state legislature. As of now, he has made no public statement except to tell Publicola that he would have liked to run in his old legislative district (that his home was redistricted out of). Director Patu appears to be running again and is having an event to celebrate her family's work in public service. Her Legacy Luau event will be Thursday, June 28th at the Pravda Events Center, 1406 10th Avenue, Suite 200 at 7 p.m. There is a $75 suggested donation. RSVP at virtuouschg@msn.com or 425-891-6705. But I'd like to document them so on the Tuesday and Friday Open Thread, please list if you hear an I-1240 signature gatherer making a false claim. On Monday, Jun 18th, at about 10 am I was at the Northgate Target where I heard a woman being told that I-1240 was just a "pilot" program for charters. That language is nowhere in the initiative. And again, I invite you to correct me if I get anything wrong. I did correct one error in my reading; charters can contract out only management (and nearly everything else) to a for-profit. They can contract out only operations to another non-profit (which is what most CMOs - charter management organizations are). They are one of the biggest growing sectors in charters. Just checking in over at the Yes on 1240 website and they finally(!) have the text of the initiative up. Still, you have to wonder - if they want you to sign the petition for it and vote for it, why wouldn't it have been there in the first place? Went by Costco today. Please to see that they don't allow any kind of solicitation or petitioning on their sites. 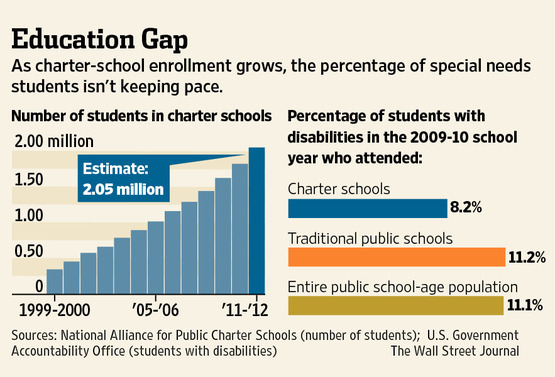 Update (Wednesday afternoon) - Interesting chart from the Wall Street Journal article on the GAO report on charters underenrolling Special Ed students. Change.org is still collecting sigs for the group. Their petitions remain. The only thing they have agreed to is to stop offering them paid promotion of their petitions. Please read the HufPo article more closely and you’ll see this is so. They have already gained over a million sigs through these automatic ads. Bottom line: Don’t sign any petitions on Change.org until you feel certain that you are not automatically registered as a “member” of Students First or Stand for Children without your knowledge. Remember how it has been reported that StudentsFirst, Michelle Rhee's organization, had petitions at Change.org that if you signed them, made you a member of StudentsFirst? Well, I guess Change.org had a change of heart because both StudentsFirst and Stand for Children have been booted out. The story at the Huffington Post is far more nuanced. Change.org leaders, for their part, said they think some of the outrage resulted from a misunderstanding of the company's goal, which is not to spread American-style progressive values around the globe, but rather to empower as many people as possible under the theory that the world will be better as a result. Q: Why are you leaving Seattle? A: "I wanted to go somewhere where I could be more actively involved in the work. The size of Highline allows me to do that. And it felt like the right time personally and professionally for me to make a move." "...aimed at bypassing elected school boards and giving parents at the worst public schools the opportunity to band together and force immediate change." Well, it does force change but is it change the only outcome parents create? Generally so. The adage "be careful what you wish for" surely applies here to those parents. I called Mayor McGinn's office and they are going to let me know if he voted on this issue and if he did, how he voted. It will be a great disappointment if he voted yes. Though it has not yet been shown to work, parent trigger has support from many of the big players seeking to inject more free-market competition into public education, including the Bill & Melinda Gates Foundation and the Walton Family Foundation. Major philanthropies and wealthy financiers have poured money into backing political candidates and advocacy groups, including one called Parent Revolution, that promote parent trigger, according to campaign finance records in several states. Opponents of parent trigger, however, pointed out that the mayors' endorsement was largely symbolic, since such policies typically require legislative approval. "Parents don't have control once they pull the trigger," said Kathleen Oropeza, co-founder of Fund Education Now, an advocacy group that successfully fought to derail a parent trigger bill in Florida earlier this year. "Who profits? Not parents and children." Keep in mind, I-1240 has such a trigger except that it's much worse. The majority of parents OR teachers can sign a petition for an approved charter to take over a school. There is NO other law or pending law in the country on this issue that allows just teachers to take over a school. And, with I-1240 it is NOT just for failing schools - it's for every single school in every single district. Bye, bye Garfield? International High in Bellevue? High-performing schools are under this trigger as well. In other news, Washington STEM announced Patrick D'Amelio as its new CEO. He was recently the head of Big Brothers and Big Sisters of Puget Sound and former CEO at the Alliance for Education. Patrick was always warm and gracious to me when he was running the Alliance. It also bore no resemblance to the Alliance you see today so naturally, I missed him when he left. Good choice, Washington STEM. On Monday, Dr. Enfield said: “deciding whether to create a stand-alone school for APP students or to house the program in multiple sites with existing neighborhood schools is a big decision, and not one I take lightly. Given our upcoming change in leadership, it is also not a decision that I would be here to defend. I am asking that incoming Superintendent José Banda work together with staff and the community on how to move forward with both program placement and capacity.” Read letter from Dr. Enfield to Lowell at Lincoln families. • Separate the two Lowell schools. The Lincoln site will now be “APP at Lincoln,” much like our other programs housed at interim sites, such as K-5 STEM at Boren. This means that Rina Geoghagan and Gregory King will no longer be co-principals, but instead serve as principals of their own buildings. The two schools will also have a separate budget structure. • Keep APP at Lincoln for the next two school years. Given our capacity issues in the north end of Seattle, we will house the program at Lincoln for the next two years. This gives District staff time to continue working on the larger picture of program placement and capacity. So now the two schools are separate and that's done. My perception is that Lowell at Lincoln community wanted this; I do not know about the feelings of the Lowell building community. I'm sure in some ways this is a bit comfort for the Lowell at Lincoln community, at least having this decision but then whatever change there is, it still looms ahead. I would think that now would be a good time to advocate to Superintendent Banda on what that community wants. He is going to have to make some decisions based on BEX IV. Frankly, I think the Lowell at Lincoln community may be in a good place to say, "this is what we want" to him because he doesn't want to make a misstep early on. Still no word on King; I wonder why anyone told the Detroit newspaper about him being a principal in that city. The word had to come from him or Goodloe-Johnson; they didn't just pull his name out of the air. I managed to miss yet another important graduation ceremony- Interagency. There was a great story on KONG-tv about this SPS program and one of its graduates. Their graduation ceremony is tonight at the Seattle Center Exhibition Hall - congrats to Interagency class of 2012! Let's start with Diane Ravitch's call at her blog for ed reform stories from around the country. It's staggering to read and most are about charters. Last Stand for Children First Illinois about how turnaround schools happen in their state. Diane's blog again - a story about the "American Indian Charter School" in Oakland, CA. The school is about 86% Asian-American, not Native American. It has been a high-performing middle school but parents and former teachers complained. An audit found that $3.7M were wrongly spent by the founder and his wife. (The founder told Newsweek that he thought it would help to get rid of school boards. He also said he would prefer the Ku Klux Klan to the teachers' unions.) I'm with Diane; if you can't trust them with the money, do you believe the test scores? Via Huffington Post by the Detroit News, some pretty sad but not surprising news: The majority of the Motor City's charter high schools underperform the city's traditional public schools, according to an analysis published Thursday by Detroit News. The report found that just six of 25 Detroit charter schools had higher math or science proficiency rates on the Michigan Merit Exam than those in Detroit's traditional public schools. The analysis notes that charter schools only surpassed Detroit Public School performance in social studies. 3) They can set academic, behavior and cultural standards that promote exclusion of students via attrition. A traditional public school or “district school” or “government school” must accept students at any point during the year and but for specific disciplinary circumstances that may permit long term suspensions and expulsions. Traditional public schools cannot shed students who do not meet academic standards, comply with more general behavioral codes or social standards, such as parental obligations. Note that while public districts may limit slots to individual schools, especially magnets (which are clearly also limited public access), districts must accommodate all comers (a charter school operated by a district would be part of a system that is not limited in enrollment). Another great article from Ed Week about who should have the final say on allowing in charters to districts. Is it a state control or local control issue? Florida, Georgia and New Jersey are all arguing this point. In Georgia, meanwhile, a ballot measure that goes before voters in the fall would re-establish a state commission with the power to create charters over the objections of local school boards. In New Jersey, a bill sponsored by a Democratic state legislator would require the approval of voters in local communities before the state could approve charters within affected school districts. If this initiative passes, I guarantee the day someone files a charter proposal for Issaquah or Bellevue or Mercer Island, you'll hear the teeth-gnashing all the way here in Seattle. As you may recall, KIRO-tv did a story about a Leschi custodian, Chester Harris, who, it was claimed, was "bullying" students. As it turns out, it was one family and their issues at the school (they were told to only drop off and pick up their child because of their continuing complaints against many staff members). The custodian's union, Local 609, had asked KIRO to retract their reports and they wouldn't. I've seen these things and boy, it's not good or fair journalism. After a three-hour-long proceeding, supervised by retired appeals court judge Karen Seinfeld, eight members of the News Council's panel voted unanimously that Halsne and his employer, KIRO TV, had inaccurately described Harris as "manhandling" and "bullying" students at Leschi, and unfairly damaged Harris's reputation. Seven of the panelists voted that KIRO is now obliged, "under generally accepted media-ethics codes," to retract its stories on Harris, remove them from its web site, air a follow-up story setting the record straight, and "apologize to all those whose reputations were damaged." KIRO did not send Mr. Halsne or any rep to the event. The WNC doesn't have any power to punish KIRO but I would think the public shame might make them rethink how this reporter creates his stories. They have said they stand by their stories. In a letter to KIRO sent after the story aired, Seattle School District spokeswoman Holly Ferguson pointed out that Halsne's own hidden camera footage appears to show Harris did nothing wrong. "From your video, it appears Mr. Harris and another adult acted appropriately to intervene with an upset student," Ferguson wrote. "Mr. Harris is very well respected in the school community and our staff and families are very upset by your coverage." "We believe it is inappropriate for you to have included under-cover camera footage of our students that clearly identifies their faces. While you did blur one student's face, the others were clearly recognizable. The families of these children are very upset and our principal reports that one of the students was in tears today as a result of your having him on television last night. We request that you take down the video immediately to protect the identity of these students." She added that KIRO had, in advance of Halsne's initial story, been provided with school district documentation showing that the school district—and the Seattle Police—had investigated the past allegations against Harris and found "no information to suggest any wrongdoing." Good for the union for sticking up for its member, good for the district for speaking up for their employee and good for the Leschi for supporting a trusted member of their community. Every so often something comes along that exposes and epitomizes a wide range of problems. This week it is the proposed Policy 2200, Equitable Access to Programs and Services. This proposed revision to Board Policy C56.00 reveals and illustrates problems with the Board's procedures, the Board's practices, the staff, program placement, the allocation of authority, the factors that really drive decisions within Seattle Public Schools, and the whole concept of governance vs. management. Update: a great story from the Times about the Ballard valedictorian this year. Mikael Perla got diagnosed with leukemia in the middle of his freshman year. He spent two grueling years fighting it off (with steroids causing him to have diabetes). He could have taken time off to fight but he continued his studies. Don't mistake Perla's persistence for arrogance. He credits his top grades to hard work and teachers who tutored him. He doesn't mention that he practically taught himself the language and math of chemistry from textbooks in bed, that he turned in every homework assignment, that he came in after school to do labs when he would be less likely to catch germs from classmates, reluctantly accepting his mom as his lab partner. Mikael Perla will attend the University of Washington in the fall after completing a summer program in engineering. He's considering a career in medicine. Good luck, Mikael - you have lots of people behind you. The West Seattle blog reports that Arbor Heights Elementary raised $500 at a bake sale to help fund cancer research for Seattle Children's Hospital. What a great effort from everyone there. Mason Klein, 6th grade at Jane Addams; Ruby Nelson, 7th grade at Whitman Middle; and Bryn Templeton, 8th grade at Blaine K-8. This year's science fair had the biggest turnout yet in terms of students, parents, and other visitors. The fair, held June 7 at the Museum of Flight, had 211 students from 11 middle schools who participated. Judges volunteered for a half-day from these companies or institutions: Boeing, Fred Hutchinson Cancer Research, Google, Institute for Systems Biology, Museum of Flight, Seattle Biomedical Research, US Forest Service, University of Washington, Seattle Public Schools, Wignall Consulting LLC, Starbucks, & Cadence MD. These organizations donated prizes: Seattle Aquarium, Burke Museum, Museum of Flight, and Woodland Park Zoo. Gary Foss is a friend of the fair and helps in many ways. Good work to all the students who participated and a big thank you to all the community supporters. Continuing high school graduations. Go get 'em, kids. Continuing high school graduations. But don't forget the sunscreen. Last Board meeting of this school year. Agenda. There appear to be a number of interesting items including the contract between LEV and the district for South Shore (and it looks more like a newish contract than a renewal because of the passage of time since the old MOU was created), vote on the Advertising and Commercial activities policy,and renewal of NWEA contract. Intro items include policy 2200, Program Placement (now called "Equitable Access to Services & Programs). I haven't read this yet but Charlie tweeted that it did not appear to make understanding program placement any better. Also, there is intro of the 2012-2013 Operations and Capital budgets which I really haven't looked at yet. Okay, I'll bite - how did this happen? Anyone? (Summer Solistice - supposed to be a good weather day for the longest day of the year). Operations Committee Meeting from 4-6 p.m. No agenda available yet. Happy to say for all, the last day of school for 2011-2012. I didn't say this in either of my threads on not signing the charter school petitions or about the pro campaign. Any statements I make about what is and isn't in initiative 1240 are based on my reading of the initiative. Two other parents read it thoroughly as well (I won't name them because I didn't ask yet) and we cross-referenced our reading. Anything I say, I am happy to back up with a citation of page and section from the initiative. Just ask. I am confident in my reading of the initiative but if someone sees something I missed or perhaps have wrong, speak up. But again, I worked with other people to make sure of my understanding of this incredibly dangerous initiative. There in no link to the initiative at the pro-side's website. They are not going to fully explain everything in the initiative. They are not going to name citations from the initiative to back up what they are saying are "facts". You are only going to see that here. You should ask yourself why that would be. No matter what side you come down on the charter debate, the important thing to consider is what is in OUR proposed law. There is NO link to the actual initiative. Why wouldn't you want people to be able to read what you want them to support? That says it all. They say "There will also be an evaluation at the end of the five-year period to determine whether additional public charter schools should be allowed." See, it's not a pilot project. Also, if this thing passes, I'd bet money they will ask for the cap to be raised in three years. Of course, they are urging people to "simply" sign the petition so voters can "consider the facts." I find this very funny because it has NEVER been LEV or Stand's work to make sure all the "facts" were put out there. They have a PDF Fact Sheet which, frankly, is repetitive and well, not what I expected as the thrust of the campaign. This campaign, unlike the bill in the Legislature, is not being framed around helping failing schools and high-needs students who attend them. This campaign is about giving all parents and students choice. Keep that in mind because I have to wonder if those kids they were so worried about in the fall are now in the background. Charter schools are independently managed public schools operated by qualified nonprofit organizations. They could be OR could be "managed" and/or "operated" by a FOR-PROFIT. The only control solely left in the hands of the charter school board is to maintain oversight authority. That is NOT the same thing as operations or management. "The initiative sets strict qualification requirements for public charter school operators and requires strict oversight and accountability standards..."
Well, somewhat true. Read the initiative and decide for yourself. I don't think the qualifications are all that strict. And, the Charter Commission does not have to follow any of them (for some reason not disclosed in the language of the initiative). What can the Charter Commission do differently? The initiative is silent on this point and you have to wonder why. We've heard from opponents in the past that we should keep to the status quo and let it work - and it does work for some students - but not for all students. I hereby publicly call them out on this statement. Show me one person - anywhere, any office, any group - that has said "keep to the status quo". You won't find one person who wants things to stay the same. But it's a tired (and false) line they keep repeating. The judge in Superior Court heard the challenge to Initiative 1240 yesterday and rejected most of WEA's reasoning (with a few tweaks). Stand for Children issued a statement saying all the changes from the WEA had been rejected but apparently they don't bother to keep up with what actually happens in court. They say they will use a combination of volunteer and paid signature gatherers (but there is no legal way to find out how many of each but I suspect an ARMY of paid). They need about 250,000 signatures to be on the ballot but it would be good to get at least 300,000 for safety's sake. The title now says "Initiative Measure No. 1240 concerns creation of a public charter school system." I totally agree with this as voters need to know this is a system and not just a few schools. The concise description is still over by 3 words but the WEA missed that. Bill Gates has given $200k to the cause and Nick Hanauer has kicked in money as well.